We’d love your help. 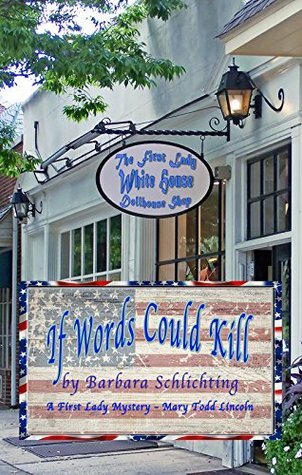 Let us know what’s wrong with this preview of If Words Could Kill by Barbara Schlichting. Ever hear of the Lost Speech of Abraham Lincoln? Neither had Liv, the owner and manager of the First Ladies White House Dollhouse Shop in Minneapolis. And when clues and bodies begin popping up, well, what's a girl to do, but to investigate! To ask other readers questions about If Words Could Kill, please sign up. Which of your books is your favorite, Barbara? I broke my rule and accepted the offer from the author to review this book without reading the first book in the series and this time that really hurt. It made it hard for me to get a grasp on these characters and things that happened in the previous book are mentioned frequently without enough of the backstory for me to sink my teeth into. I almost stopped reading this one to go back and read the first book but my reading schedule was just too full to do that. Liv has a shop dedicated to First Lady White House Dollhouses, complete with the proper furnishings, rugs and even dishes. She is somehow related to Dolley Madison. This second book in the series has a Lincoln theme. An Mary Todd Lincoln impersonator comes to town to talk about clues she has uncovered regarding a lost Abraham Lincoln speech. Before she can give her presentation she is found dead outside Liv’s store. Liv gets right into the middle of the investigation assisting the police with clues she finds in the deceased belongings. Liv’s family is all very supportive of her store and they help her out there often. She seems to get several customers for what to me is quite a specialty store. In this story she held an event where she sold many dollhouses in one day. That was good because she also picked up a couple of pricey Lincoln pieces online during the same time period. The premise of the mystery is a good one, and maybe because I was trying so desperately to get a handle on all the characters I had an idea of whodunit quite early in the book. I will say I was surprised to find out I was actually right. I have read a few books about Mary Todd and Abraham Lincoln but didn’t know anything about a lost speech. With a little internet search I learned that the speech was indeed lost but that is where the rest of this story becomes fiction. It seems his friend H.C. Whitney did take notes of the speech, which were later published. I enjoyed this author’s little twist on history and it brought the speech to my attention. I can tell the author did a great deal of research not only into the speech but Mrs. Lincoln and several other first ladies. Her character Liv is very knowledgeable about the first ladies and through her the author was able to share many little tidbits. La storia è buona ed interessante, anche se ho capito ben presto quali fossero i colpevoli. Il problema è come è raccontata: più volte ho avuto l'impressione che fosse saltato un passaggio logico, per così dire. Nonostante tutto credo che continuerò a leggere questa serie, anche perché ogni volta imparo qualcosa di più sulla storia americana, di cui so davvero poco, se non nulla. This book is in a series called "First Ladies White House Dollhouse Shop" and I just love it. The plot in every books is so different and she always involves her grandma which I love. This is a well written and fun book to read and I look forward to reading another. Barbara hit a home run with this book! Barbara Schlichting is the author of the A FIRST LADY Mystery Series where Modern characters make History. DOLLEY MADISON: A Blood Spangled Banner draws upon important historic facts to solve a modern-day mystery.” Beth Solheim, author of At Witt’s End and Outwitted. “Great debut.” Lavender magazine E. Boatner. “Author Barbara Schlichting blends American history with modern-day murder in this char Barbara Schlichting is the author of the A FIRST LADY Mystery Series where Modern characters make History. DOLLEY MADISON: A Blood Spangled Banner draws upon important historic facts to solve a modern-day mystery.” Beth Solheim, author of At Witt’s End and Outwitted. “Great debut.” Lavender magazine E. Boatner. “Author Barbara Schlichting blends American history with modern-day murder in this charming debut mystery.” Linda Reilly Author of Out of the Dying Pan “Look for the next book in the series titled.